Short repeats in human TONDU, fly vestigial and other proteins. The mammalian TEF and the Drosophila scalloped genes belong to a conserved family of transcriptional factors that possesses a TEA/ATTS DNA-binding domain. Transcriptional activation by these proteins likely requires interactions with specific coactivators. In Drosophila, Scalloped (Sd) interacts with Vestigial (Vg) to form a complex, which binds DNA through the Sd TEA/ATTS domain. The Sd-Vg heterodimer is a key regulator of wing development, which directly controls several target genes and is able to induce wing outgrowth when ectopically expressed. 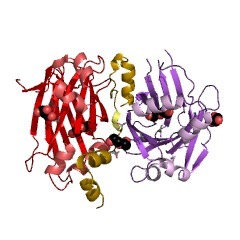 The human protein, TONDU, contains a short domain homologous to the domain of Vg required for interaction with Sd. TONDU specifically interacts with a domain conserved in all the mammalian TEF factors [(PUBMED:10518497)]. There are 2859 TDU domains in 1818 proteins in SMART's nrdb database. Taxonomic distribution of proteins containing TDU domain. This tree includes only several representative species. The complete taxonomic breakdown of all proteins with TDU domain is also avaliable. Click on the protein counts, or double click on taxonomic names to display all proteins containing TDU domain in the selected taxonomic class. Mammalian vestigial-like 2, a cofactor of TEF-1 and MEF2 transcription factors that promotes skeletal muscle differentiation. Expression of many skeletal muscle-specific genes depends on TEF-1 (transcription enhancer factor-1) and MEF2 transcription factors. In Drosophila, the TEF-1 homolog Scalloped interacts with the cofactor Vestigial to drive differentiation of the wing and indirect flight muscles. Here, we identify three mammalian vestigial-like genes, Vgl-1, Vgl-2, and Vgl-3, that share homology in a TEF-1 interaction domain. Vgl-1 and Vgl-3 transcripts are enriched in the placenta, whereas Vgl-2 is expressed in the differentiating somites and branchial arches during embryogenesis and is skeletal muscle-specific in the adult. During muscle differentiation, Vgl-2 mRNA levels increase and Vgl-2 protein translocates from the cytoplasm to the nucleus. In situ hybridization revealed co-expression of Vgl-2 with myogenin in the differentiating muscle of embryonic myotomes but not in newly formed somites prior to muscle differentiation. 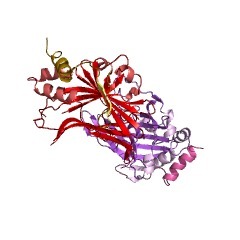 Like Vgl-1, Vgl-2 interacts with TEF-1. In addition, we show that Vgl-2 interacts with MEF2 in a mammalian two-hybrid assay and that Vgl-2 selectively binds to MEF2 in vitro. Co-expression of Vgl-2 with MEF2 markedly co-activates an MEF2-dependent promoter through its MEF2 element. Overexpression of Vgl-2 in MyoD-transfected 10T(1/2) cells markedly increased myosin heavy chain expression, a marker of terminal muscle differentiation. These results identify Vgl-2 as an important new component of the myogenic program. TONDU (TDU), a novel human protein related to the product of vestigial(vg) gene of Drosophila melanogaster interacts with vertebrate TEF factorsand substitutes for Vg function in wing formation. The mammalian TEF and the Drosophila scalloped genes belong to a conservedfamily of transcriptional factors that possesses a TEA/ATTS DNA-bindingdomain. Transcriptional activation by these proteins likely requiresinteractions with specific coactivators. In Drosophila, Scalloped (Sd)interacts with Vestigial (Vg) to form a complex, which binds DNA throughthe Sd TEA/ATTS domain. The Sd-Vg heterodimer is a key regulator of wingdevelopment, which directly controls several target genes and is able toinduce wing outgrowth when ectopically expressed. Here we show that Vgcontains two distinct transcriptional activation domains, suggesting thatthe function of Vg is to mediate transcriptional activation by Sd. Byexpressing a chimeric GAL4-Sd protein in Drosophila, we found that thetranscriptional activity of the Vg-Sd heterodimer is negatively regulatedat the AP and DV boundary of the wing disc. We also identify a novel humanprotein, TONDU, which contains a short domain homologous to the domain ofVg required for interaction with Sd. We show that TONDU specificallyinteracts with a domain conserved in all the mammalian TEF factors.Expression of TDU in Drosophila by means of the UAS-GAL4 system shows thatthis human protein can substitute for Vg in wing formation. We proposethat TDU is a specific coactivator for the mammalian TEFs.